BOSTON (AP) — Boston Bruins goaltender Tuukka Rask returned to practice on Tuesday after taking a three-day leave of absence to attend to a personal matter. “This is a family and we are a family and we take care of each other when times are tough,” Rask said about the team he’s been with since 2006. The Bruins granted Rask the leave of absence on Friday. Rask acknowledged the matter was related to his family, but didn’t share details. When asked if he felt unburdened after the time off, he said “yes” and added “resigning (or) quitting the job wasn’t” something he considered. The 31-year-old Rask is second on the Bruins’ all-time list in games played (457) and wins (242). He’s 12 games and 11 wins from passing Tiny Thompson for the franchise records. This season, he’s struggled with a 4-4-0 record, .901 save percentage and 3.05 goals-against average. But he didn’t draw a line between his off-ice issues and what’s happened on the ice. The Bruins won both games over the weekend. Goaltender Jaroslav Halak stopped 77 of 79 shots in a 5-1 win against the Toronto Maple Leafs on Saturday and a 4-1 win against the Vegas Golden Knights on Sunday. Boston is 10-5-2 and tied for second place in the Atlantic Division. The Bruins won’t rush Rask into game action. Coach Bruce Cassidy said Halak will start the next game on the road against the Colorado Avalanche on Wednesday. 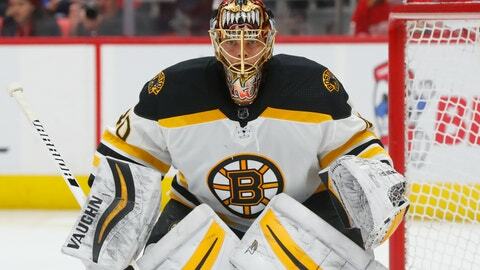 Rask will start either Friday at the Dallas Stars or Saturday at the Arizona Coyotes.